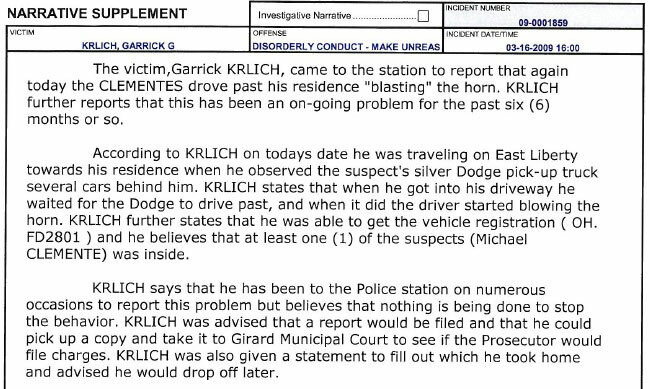 Since members of the Clemente family, their friends, associates, and others began harassing the Krlich family in 2008, Rick Krlich has filed hundreds of police reports. Some of the reports led to charges being filed, others were ignored, and many were used as evidence in hearings that led to the issuance of civil protection orders against the people who tormented the Krlich’s morning, noon, and night. Viewed in total, the reports reproduced on this page do one thing: they provide irrefutable proof of the attacks against the Krlich family and the indifference of the public officials who should have long ago stepped in to protect a law abiding citizen.